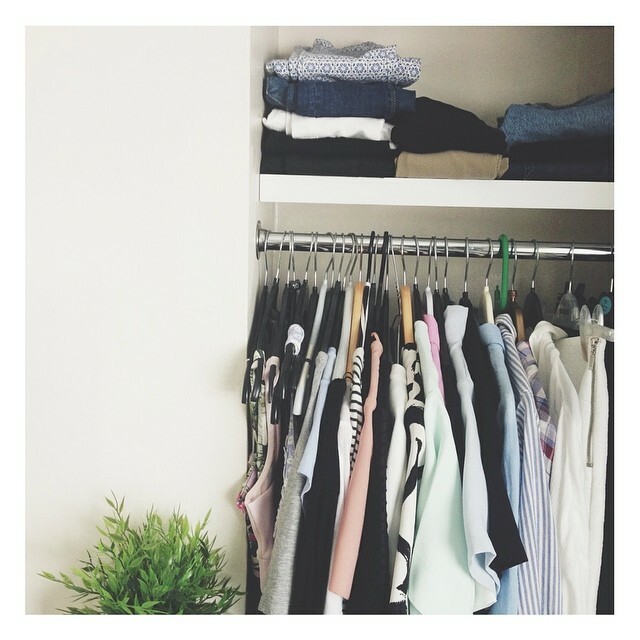 5 Reasons to have a wardrobe clear-out & some tips. Organising things is probably up there in my top 5 things to do, its just so refreshing to have a clear out and ensure everything is neat and tidy. I'm not this way with everything, but i do like to make sure i have a wardrobe re-jig and clear out at least every season. Here are some reasons why you should do the same and some tips to help you along the way to a cleaner, clearer wardrobe space! These tips could of course be applied to anything, like your makeup collection, but i may make a separate post on that. Anna also recently made a video (here) all about this is you'd like some extra helpful pointers other than mine. A wardrobe clear out means you can see what you actually have in your wardrobe. Keeping clothes 'just in case' often leaves you with a ton of clothes which you won't wear, and no space to add in things which you will wear. Having only clothes you love in your wardrobe is really refreshing and makes getting ready 10x easier and more enjoyable. You may find and remember some clothes you loved and forgot about. Every time i have a sort out i find something and remember how much use i got out of it, giving me inspiration for more outfits and meaning i actually get use out of all of my clothes. Its a chance to try out new outfit combinations you normally wouldn't try due to not wanting to rummage through everything. I find this especially handy with fashion blogging - i used my recent clear out to give me inspiration for outfit posts i could put together and just outfit combinations which i wouldn't usually reach for due to being used to wearing the same clothes over and over out of ease. You can see where the gaps are in your wardrobe, so that you can add in any pieces which you think would fit in well. When you have an abundance of clothes you never seem to think there may be something you actually need in your wardrobe, but its surprising when you have a clear out how many pieces you feel like you are lacking in. Before i went to London i had a clear out and realised i was in dire need of more plain skirts, so i picked up the American Apparel Tennis Skirt in white i had been lusting after but not wanting to spend the money on due to having a load of other skirts(which i just didn't wear). A wardrobe clear out is a great way to make some money. You never really realise how much money you have lying around in clothes you don't wear, until you get selling. Good ol' eBay and now Depop are great to use when you want to get rid of some old things, as you're sure to find a better home for them and make some money in the process, rather than having them sitting around collecting dust. Anything that doesn't sell you can give to charity, which is always a good feeling. I've currently got three big piles of clothes i need to stick on Depop from this clear out, and its nice to see my rail relatively empty! Take EVERYTHING out of your wardrobe. Even all the things on shelves/in drawers. This means you can really see just how much you have, and then you can build your wardrobe again from scratch. Make some piles. I tend to make a keep pile, a maybe pile, a winter pile, a sell pile and a charity pile. Along with having a bin bag for clothes which just need binning! This way i can immediately see what i want to keep and know i wear, what i know i'll wear come wintertime, and what i definitely will never wear again. Once your left with the maybe pile, try on some of the clothes to see if you feel comfortable in them and if they're very 'you'. I often find i buy into trends, wear them once and then never wear them again as they're just not me. Its horrible to get rid of practically brand new things, but sometimes it just has to be done. If there are multiples of things in the maybe pile, such as a couple of shirts or dresses which are pretty similar, i tend to keep the one i like the most and get rid of the other, as if i'm unsure of it i definitely don't need two of it. Have a look at the things in the maybe pile, and have a think if there is anything on your wishlist similar which you'd much rather purchase. I know i'm lusting over the larger Whistles clutch bag, so once i've sold a couple of my clutches i barely use i'm going to pick one up stat. Put everything back in some kind of order. Some people colour code, some people use sections for different items. I go for the latter. This way when i'm getting ready i can choose something from each section. I don't colour code these sections as i tend to have a mix of colours. This again also helps me to see if i'm lacking in anything. About a year ago i could see that i had a HUGE amount of bottoms, but barely any tops to pair with them. Now roles seem to have reversed and i'm in dire need of some new trousers! Hopefully this has helped to inspire you to have a clear out yourself. Let me know if you make any progress!